Reduce the need for multiple pass cleaning with the versatile M17 battery sweeper-scrubber. The M17 delivers exceptional sweeping and scrubbing performance, and it provides health and safety benefits. The M17 sweeper-scrubber is easy to operate and maintain, and quickly improves your facility’s image. Tennant’s M17 Battery Sweeper-Scrubber increases productivity with features designed to maximize efficiency and provide high-performance results. Capture large and small debris in a single pass with DFS™ (Dual Force Sweeping) technology. Clean up to three times longer with a single tank of water using Tennant’s innovative ec-H2O™ technology that uses up to 70% less water. Maintain indoor air quality with exceptional two-stage dust control and fume-free battery operation. Improve operator visibility with cab-forward design, steering-wheel-mounted controls and engineered sightlines. Extend cleaning time with the largest available battery capacity in its class. Get superior cleaning performance from your M17 with TennantTrue® Parts that have been designed specifically to help maximize cleaning effectiveness in one pass and achieve better cleaning performance at a lower total cost. Achieve better performance while lowering costs associated with rework, labor, safety and maintenance by using genuine TennantTrue® brushes, specifically designed for your M17 machine. Don’t settle for less - choose TennantTrue® brushes! The squeegee is one of the most critical parts on your M17 Sweeper-Scrubber. Only genuine TennantTrue® squeegees are designed specifically to fit with your M17 machine to deliver exceptional liquid collection and pick-up for optimal cleaning performance. The correct fit helps reduce downtime and service calls, lowers labor costs and puts money back into your business. Optimal performance for your M17 depends on Planned Maintenance. Rely on Tennant’s factory-trained service network for unmatched knowledge and expertise to maintain you machine and keep downtime to a minimum. Assures peace of mind – maintenance and breakdown coverage, provides budget management and control, helps maximize uptime and equipment life. Provides predictability and control of routine maintenance costs. Pay for services when performed based on actual labor and parts. Let our Technicians help you discover how to best care for your machine. Versatile cleaning performance and quality construction reduce cost of ownership. 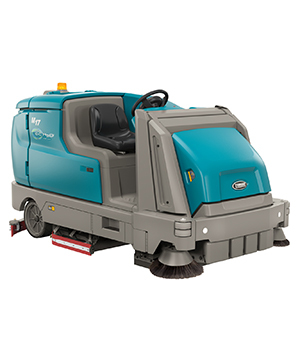 Excellent scrubbing, sweeping, water recovery and edge cleaning performance reduces the need for multiple machines. Optional scrubbing side brush increases productivity by providing a 20% wider scrub path. Optional Pro-Panel™ touch screen control module with Pro-ID™ operator login and supervisor settings prevents misuse and protects your investment. Powered high dump of swept debris eliminates the need to manually handle debris when dumping, helping to lower your labor costs. 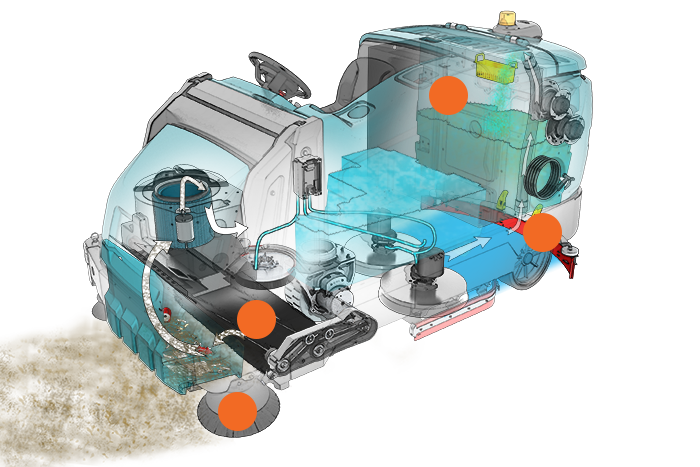 PerformanceView™ on the optional Pro-Panel™ allows operators to view the scrubbed path without having to turn around in seat, promoting safe operation. Two-stage dust control featuring the ShakeMax™ filter shaker improves air quality by containing dust generated during the sweeping process. Fume-free cleaning performance helps to maintain a safe environment. Ensure operator safety and comfort with improved sightlines, spacious cab-forward design and full front operator foot and leg protection. Pro-Check™ pre-operation checklists featured on the optional Pro-Panel™ help ensure a good start on cleaning operation. Effective sweeping and scrubbing capabilities deliver consistent cleaning results in even the toughest environments. Leave a clean path and reduce streaking with unique rear swinging squeegee that provides uniform suction for exceptional water pickup. Standard dual sweeping side brushes ensure the entire scrub path is swept, protecting the squeegee from debris and reducing streaking. Zone Settings™ on the Pro-Panel™ take the guesswork out of cleaning and help ensure consistent performance. 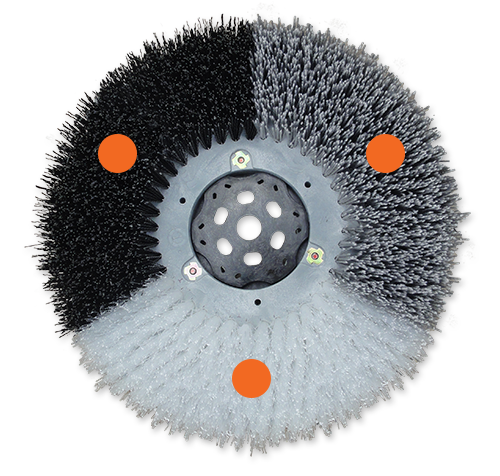 DFS™ (Dual Force Sweeping) technology effectively captures large and small debris in a single pass. QA Controls® allow the supervisor to lock in machine settings, reducing operator errors which can produce poor results. ec-H2O™ equipped with the Severe Environment™ switch allows users to benefit from detergent-free cleaning and access on-board chemicals as needed. Touch-n-Go™ control module with 1-Step™ button allows easy access to all settings without removing hands from the steering wheel. Easy-to-identify yellow touch points help simplify preventative maintenance. Easy, no-tool access to all squeegees, brushes and filters helps reduce time spent on maintenance. Optional spray nozzle provides quick and easy recovery tank cleanout.